• 850 sq. ft., 1 bath, 2 bdrm single story – $73,900 CAD. IMMACULATE CONDITION CONDO APARTMENT ON 2ND FLOOR! This great condo is located in a great central location within walking distance to many amenities and short drive to Trans-Canada highway. 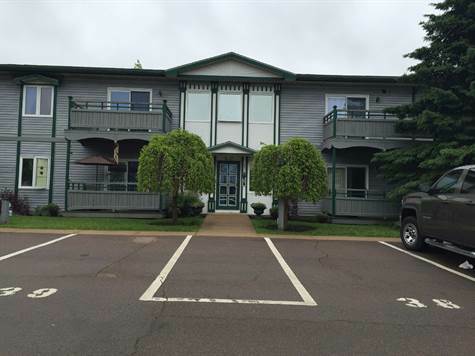 The 2 bedroom unit is located on the 2nd floor in a secure building. The condo features an open concept kitchen, dining and living room with patio doors accessing your balcony. The balcony is a good size allowing you to comfortably have a bistro table with 2 chairs and some flower pots and plants. There is a very large master bedroom with very spacious walk-in closet and a 2nd good size bedroom also. There is a 4pc bathroom with linen closet. Included in this price are the fridge, stove, and stackable washer and dryer. Flooring is carpet and vinyl in excellent condition. There is also a storage area just a few steps down the hall. Condo fees are $240 per month. At this price, it is very affordable to own your own space. Call today!